One of the best women's suffrage books, Remember the Ladies releases in paperback for the 100th anniversary of the 19th amendment with unforgettable stories of the courageous leaders who secured women's right to vote. When the Second Continental Congress of the thirteen colonies convened to draft the Declaration of Independence, Abigail Adams admonished her husband, John Adams, to "remember the ladies" to no avail. From the birth of our nation to the crushing defeat of the first female presidential nominee for a major party, this popular history highlights women's impact on United States politics and government. 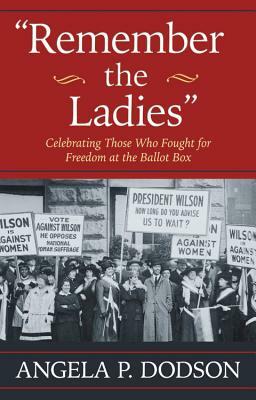 first-hand letters, beautiful black and white photos, historical cartoons, charts and graphs, as well as posters, ads, and buttons, Remember the Ladies presents this often-forgotten struggle-and its roots in other justice work-in an accessible, conversational, relevant manner for a wide audience. Here are the groundbreaking convention records, speeches, newspaper accounts, letters, photos, and drawings of those who fought for women's right to vote, arranged to convey the inherent historical drama. The accessible almanac style lets our compelling history speak for itself. From an award-winning author and former New York Times editor, Remember the Ladies does not extract women's suffrage from the inseparable concurrent historic endeavors for emancipation, immigration, and temperance. Instead, its robust research documents the intersectionality of women's struggle for the vote in its true context with other progressive efforts.